Please share your name/pronouns, where you work or study, and what you want to be when you grow up! You can choose any career for your next role, no rules or limitations. 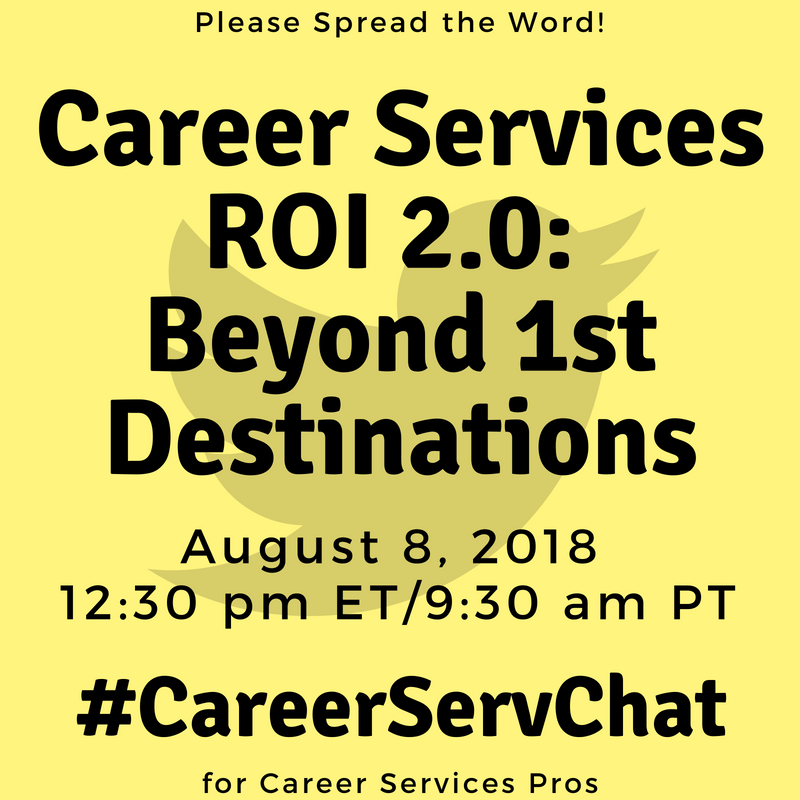 Remember to finish each tweet with the #CareerServChat hashtag. Thanks for joining in! The chat will last an hour and each question will be numbered (Q1, Q2, etc.). When you answer, begin each response with A1, A2, etc. The last 5 minutes are just for networking and resource sharing. Get ready for Q1 and remember the hashtag #CareerServChat. Q2. In your work, studies, or related experience, are you ever asked to “make the case” for career education and career services? If yes, to what extent do you rely on institution-specific statistics and metrics such as career outcome rate? Q3. Quick, answer this one without thinking too much. “When I hear the phrase First Destination Survey (in the US) or Graduate Outcomes Survey (for UK HE pros), my initial gut reaction is…?“ It’s OK to be honest, you’re among friends! Q5. Now for a few philosophical questions; think in terms of higher ed as a whole, not your institution. @NACEOrg reports 16% of undergrads in the Class of 2016 were seeking a job or further education at 6 months post-grad. Is that good or bad? Q6. If you had a magic wand and could get robust data for one later point in time, how long after graduation would be the ideal time to survey alumni about their career outcomes? 3 years? 20 years? When do we know what we want to be when we grow up? Q7. Finish this sentence: “In addition to career outcome rate, the true impact of career services is demonstrated by…?” Quantitative OR qualitative measures are OK! Circle time! Share blog posts, research, & resources related to this topic. If you found a chat participant to be helpful, follow ‘em here and then connect with ‘em on LinkedIn. Thanks so much for joining us! We’ll be back here on the second Wednesday of September, 9/12 at 12:30 pm ET/9:30 am PT. Invite a colleague! And follow the Twitter handle @CareerServChat so you get a reminder tweet. You're almost done! Please check your email to confirm your subscription. Thanks.